To get the latest trends and recent home sales, please visit and bookmark this page. Sunnyvale's 94087 Zip Code area is showing a tremendous boost in both Sale Price To List Price Ratio and Average Days On Market number as seen in the chart above for Single Family Homes. While May 2012 was a super hot month for this area, June is no less with average Days a home sits in market to sell is at 21 days - a very good number indicating healthy balance of demand and supply. From an average of 50 Days On Market in January 2012, the number came down to just 13 days in May 2012 and is up now at 21 in June 2012. 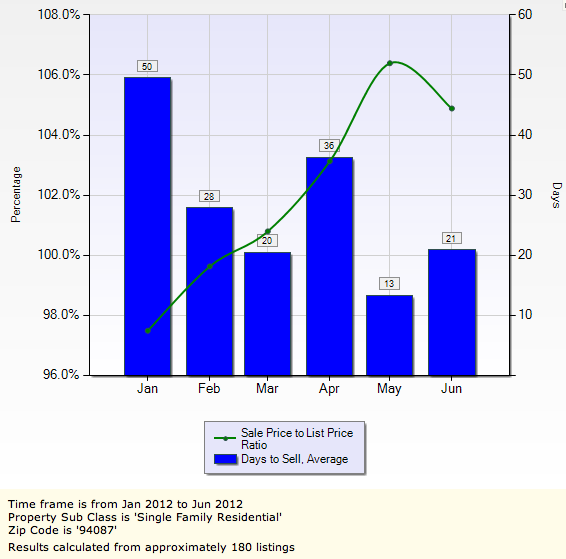 The Average Sale Price was approximately 98% of the Average List Price in January 2012. That ratio moved up to 106.2% of List Price as of May, 2012 and while this brought about many multiple offer sales in the area, the numbers for June 2012 at around 105% indicate only a slight cooling from the overheated situation of May. But it is by no means a slow down as buyers are aplenty while inventory is hard to come by. To get the latest trends and recent home sales, please bookmark this page. See the graphic below for a good idea of the rate of New Listings compared to the number of Sold Listings. As you can see above, the month of June has the number of Homes Sold at 41, above the number of New Homes For Sale Listings which is at 38 in Sunnyvale. 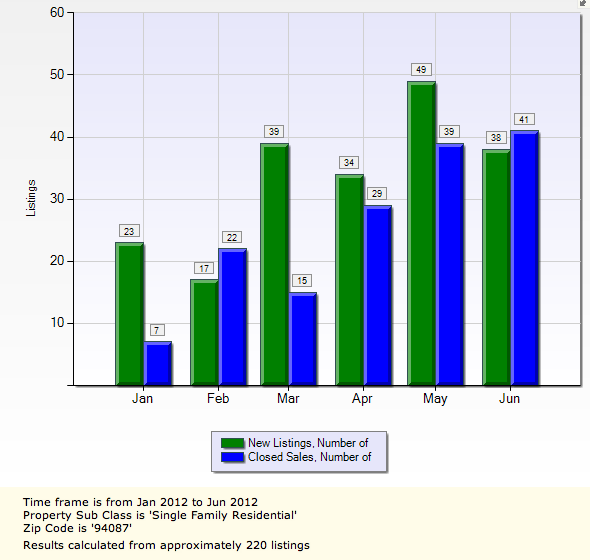 This is the first month where we see the rate of closed sales higher than the new listings. In the past months, new listings kept up a stead pace but with buyer clamoring for homes in this hot neighborhood, the sales have been outpacing new listings. 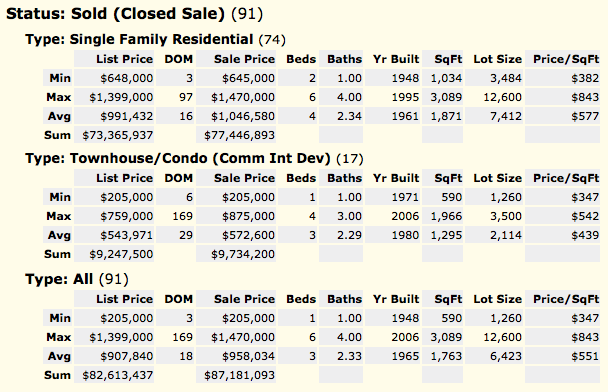 Here's an interesting set of statistics on the recent (April - June 2012) home sales statistics in Sunnyvale's 94087 zip area. As the economy improves, and more companies hire around Silicon Valley, including reported moves to Sunnyvale by tech giants Apple and Google, the real estate market here, and overall in Silicon Valley, is expected to continue this momentum over the summer of 2012. Is this a good time to sell your house? A high demand market is typically a very good time to sell. If you would like to discuss how to make the most for your house, call me for a no-obligation evaluation, and a listing presentation. Let me show you how you can take advantage of this market situation to get multiple offers on your property for a smooth, successful sale. My goal is to make the sale of your home successful, and worry-free for you, using my core online and offline marketing skills, leveraging my network of industry contacts and long list of buyers, and my core values of integrity and exceptional service! Is this a good time to buy your dream home? With the improving economy, Silicon Valley real estate market is on a turnaround moving up from its lows. Purchasing your dream home is a long-term financial decision, and doing so during a turnaround with historically low interest rates can be a great decision lasting many years. Real Estate investors typically invest during turnaround opportunities as they see it as once-in-a-lifetime opportunity especially given the housing collapse of the last few years. Please call me at 408-861-8026 to find out how I can help you find your dream home, and help you throughout the purchase process. My goal is to make you a happy and proud homeowner.